Morrowind is the northeastmost province of the Tamrielic Empire, bounded on the north and east by the Sea of Ghosts, on the west by Skyrim, on the southwest by Cyrodiil (also known as the Imperial Province), and on the south by Black Marsh (also known as Argonia). Vvardenfell District encompasses Vvardefell [sic] Island, a great land mass dominated by the giant volcano Red Mountain and cut off from mainland Morrowind by the surrounding Inner Sea. Only recently open to settlement and trade, most of the island's population is confined to the relatively hospitable west and southwest coast, centered on the ancient city of Vivec and the old Great House district centers at Balmora, Ald'ruhn, and Sadrith Mora. The rest of the island is covered by hostile desert wastes, arid grasslands, and volcanic badlands, and thinly populated by the nomadic Ashlander tribes. Vvardenfell has nine basic geographic regions, each with their own distinctive plants and terrain features. Scholars have based their classifications on the different types of land described by the native Ashlanders, so the designations are recognized by most local traders, travelers, and adventurers. These geographic regions are called: the Ascadian Isles, the Ashlands, Azura's Coast, the Bitter Coast, the Grazelands, Molag Amur, Red Mountain, the West Gash, and Sheogorad. The Ascadian Isles is a region of lush, green, well-watered southern lowlands where most of Vvardenfell's agriculture is found. The area includes Pelagiad, Suran, Vivec City, and Ald Sotha along with the inland lakes and waterways of the Ascadian Isles proper. The urban areas of Vivec and Ebonheart of the southern coast are densely populated; the inland Ascadian Isles are dotted with small farms and large plantations. The climate is temperate and comfortable, with moderate rainfall. Ebonheart is the seat of the Imperial government for Vvardenfell district, and a busy center of maritime trade. Castle Ebonheart is the home of Duke Vedam Dren, the district's ruler and Emperor's representative. Also located at Castle Ebonheart are the Vvardenfell District Council chambers and the Hawk Moth Legion garrison. The officers, docks, and warehouses of the East Empire Company are also found in Ebonheart. Vivec City is the largest settlement on Vvardenfell, and one of the largest cities in the East. Each of the great cantons is the size of a complete town. The High Fane and the palace of Vivec are visited by hundreds of tourists and pilgrims daily. Citizens flock to the Arena for entertainments and war games. Outlanders mostly confine themselves to the Foreign Canton, while natives live, work, and shop in the Great House compounds and residential cantons. Ald Sotha is a splendid Daedric ruin within sight of Vivec City. Though exotic and picturesque, it is a dangerous site, haunted by old magics, dark cultists, and their Daedric summonings, and not recommended for sightseers. Suran is an agricultural village in the northeastern corner of the fertile Ascadian Isles region. Two popular pilgrimage sites are nearby -- the Fields of Kummu and the Shrine of Molag Bal. Pelagiad is a newly chartered Imperial village between Balmora and Vivec City on the western edge of the Ascadian Isles region. The village is right outside the Imperial Legion garrison at Fort Pelagiad. The houses and shops are built in the Western Imperial style, and Pelagiad looks more like a village in the western Empire than a Morrowind settlement. The Ashlands are the dry, inhospitable wastelands surrounding the lower slopes of Red Mountain. The Ashlands extend to the Sea of Ghosts in the north, and elsewhere form a wide margin between the blighted Red Mountain region and other geographic regions. The village of Maar Gan is the only sizable permanent Ashlands settlement; Ald'ruhn, the district seat of House Redoran, is on the margin of the region. Ashlanders hunt for game here, and their herds find sparse grazing. It rains rarely, and suffers frequent ash storms. Maar Gan is a small isolated village in a remote region north of Ald'ruhn. The Maar Gan shrine is an important Temple pilgrimage site. The Ashlander Urshilaku tribe has a permanent settlement at Urshilaku camp in the Ashlands region north of Maar Gan village. The rugged coast and islands of northern and eastern Vvardenfell are called Azura's Coast. The region is rocky, infertile, and largely uninhabited, except for the outpost at Molag Mar, the Telvanni settlements at Sadrith Mora, the wizard towers at Tel Aruhn, Tel Mora, and Tel Branora, and Ahemmusa camp and the remote fishing villages of Ald Redaynia and Dagon Fel on the north coast. There are no roads; most travel is by boat. Despite the rocky terrain, a variety of plants thrive on the regular rainfall. Sadrith Mora is the district seat of House Telvanni, and home of the Telvanni Council, though only one Telvanni councilor actually lives in Sadrith Mora. Sadrith Mora is an island settlement, and accessible only by sea and teleportation. The town is large, with many services, but it is open only to Telvanni retainers; outsiders must confine themselves to the Gateway Inn. Tel Branora is the tower and seat of the eccentric Telvanni wizard named Mistress Therana. The tower and its tiny village are located on a rocky promontory at the southeasternmost tip of Azura's Coast. Tel Fyr is the Telvanni tower of Sorcerer-Lord Divayth Fyr. Beneath the tower is the Corprusarium, a refuge-prison where the deranged, distorted victims of the deadly corprus disease are housed and tended. Tel Aruhn is the Telvanni tower of Archmagister Gothren, Telvanni Sorcerer-Lord and head of the Telvanni Council. The associated settlement is a sizable village, and the site of the Festival Slave Market, the largest slave market on Vvardenfell. Tel Mora is the Telvanni tower of Mistress Dratha, an ancient wizard of the Telvanni Council. The small settlement includes a few craftsfolk and a tradehouse. Tel Vos is the tower of Telvanni wizard and council member Master Aryon. Tel Vos is a peculiar blend of Telvanni and Western architectural styles, and is close to Vos village. Bal Fell is the "City of Stone," an ancient First Era ruin in the southeastern islands and promontories of Azura's Coast. The site has a nasty reputation, and several Telvanni wizards currently have competing camps of hirelings and adventurers exploring and looting there. Legend says that Bal Fell was built on the site of an ancient Daedric worship center. The Ashlander Ahemmusa tribe has a permanent settlement at Ahemmusa camp on a rocky promontory at the northeastern tip of the Vvardenfell mainland in the Azura's Coast region. The western coast of Vvardenfell from Seyda Neen north to Gnaar Mok is called the Bitter Coast. The salt marshes and humid swamps of this region are uninhabited, with the only settlements found at the good harbors of Gnaar Mok, Hla Oad, and Seyda Neen. Also called the Smuggler's Coast, the region's secluded coves and islands provide refuge for criminal trade, and the frequent rain and fog hides small boats from Excise cutters. The piercing light of the Grand Pharos at the mouth of the harbor of the port village of Seyda Neen is a beacon to mariners throughout the Inner Sea. Most visitors from the Empire make landfall at the port of Seyda Neen, where they are processed by the Imperial Census and Excise Commission agents of the Coastguard station. The Coastguard cutters docked here control smuggling and piracy on the Inner Sea. Hla Oad is a tiny isolated fishing village on western Vvardenfell in the Bitter Coast region. A rough track along the River Odai connects Hla Oad with the town of Balmora. Gnaar Mok is a tiny island fishing village in the Bitter Coast region of western Vvardenfell. The regular rain and dark soils of the Grazelands produce the rich grazing for Ashlander herds that give the region its name. The region lies in the northeast of Vvardenfell, sandwiched between the Ashlands and Azura's Coast. Permanent settlements include Vos village and the towers of Tel Vos and Tel Fyr. The Ashlanders of Zainab camp move their herds across the plains in search of fresh grazing. There are no roads or tracks, but travel is easy across the open plains. The Ashlander Zainab tribe has a permanent settlement at Zainab camp, near the village of Vos in the Grazelands region. Located inland in the southeast of Vvardenfell, Molag Amur is an uninhabited wasteland of rocky hills, steep-sided ravines, lava pools, and barren ash pavements. Pathfinding and travel is extremely difficult in this trackless wilderness, and is complicated by frequent ash storms. The Ashlanders of Erabenimsun camp hunt game here, but few others venture into this region. The worst part of Molag Amur, called the Great Scathes, is considered impassible even by the Ashlanders. The outpost at Molag Mar is a fortified stronghold on the southeastern edge of the desolate Molag Amur region. Pilgrims bound for the nearby pilgrimage sites at Mount Assarnibibi and Mount Kand take refuge at the outpost's hostels, comforted by the garrison of Redoran and Buoyant Armiger crusaders stationed at the stronghold. The Ashlander Erabenimsun tribe has a permanent settlement at Erabenimsun camp, an isolated hut settlement in the middle of the desolate Molag Amur region. The dominant feature of Vvardenfell, Red Mountain, is a vast volcano in the center of Vvardenfell. The outer slopes are steep and rugged, and the crater is deep and dotted with surface lava. The Ghostfence, a magical barrier which blocks travel as well as seals in the harmful, disease-laden weather called 'blight,' rings the volcano's outer slopes, and is broken only at Ghostgate. Within the Ghostfence, rain never falls and the sun never shines; the only weather is the red and deadly ash-blight. Ghostgate is the gate citadel of the Ghostfence Ordinator and Buoyant Armiger garrisons. Ghostgate sits astride the only gap through which the monstrous hosts of Dagoth Ur might emerge from Red Mountain to threaten the rest of Morrowind. The Ghostfence itself is a colossal magical artifact that completely encircles Red Mountain and prevents the Blight from spilling its corruption across the rest of Vvardenfell. The western highlands of Vvardefell [sic] are called the West Gash. 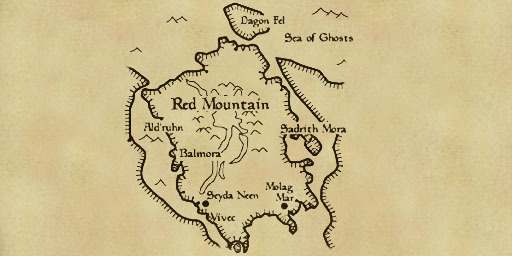 The region extends from the Sea of Ghosts on the northwest coast to the inland town of Balmora, where the region is sandwiched between the Bitter Coast and the Ashlands. The trading village of Gnisis is north of Ald'ruhn, and the fishing villages of Ald Veloth [sic] and Khuul lie on the north coast. The town of Caldera lies near Balmora. The herds of the Ashlanders of Urshilaku camp graze on the sparse but hardy highland vegetation. Balmora is the district seat of House Hlaalu, and the largest settlement on Vvardenfell after Vivec City. Good roads lead north to Ald'ruhn and south to Caldera, Seyda Neen, and Vivec City. The Imperial Legion garrison of Fort Moonmoth lies south of Balmora. Caldera is a recently chartered Imperial town and mining corporation. The Caldera Mining Company has been granted an Imperial monopoly to remove raw ebony from the rich deposits here. Caldera has the appearance and flavor of a Western Imperial town. Ald'ruhn is the district seat of House Redoran, and a large settlement. The Redoran Council chambers are located inside the shell of an ancient extinct giant crab. Tracks lead north to Maar Gan and Gnisis villages and south to Balmora. Gnisis is a small mining and trade village astride the silt strider caravan route between the northwest West Gash and Ald'ruhn. Ald Velothi and Khuul are tiny fishing villages on the northern coast of the West Gash. The large island of Sheogorad lies north of Vvardenfell. This island and its associated lesser islands are a maritime wilderness extending north from Vvardenfell into the Sea of Ghosts. The region is largely hostile and uninhabited, with two small villages at Ald Redaynia and Dagon Fel. Only Dagon Fel is reached by ship services; all other island-to-island transport must be provided by the traveler. This page was last modified on 28 September 2018, at 04:50.